Ophiuchus – is there a thirteenth sign? Sheilagh’s Question: Who the heck is Ophiuchus? I’m surprised you’ve never heard of the constellation of Ophiuchus, Sheilagh. Ever since I’ve been an astrologer, every few years when they have nothing better to do, the media decide to indulge in a bit of Sun Sign astrology-bashing.They announce that astrology has been totally discredited by the existence of a thirteenth sign, ie Ophiuchus, the serpent bearer. 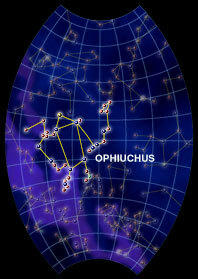 Ophiuchus is one of thirteen constellations that cross the ecliptic. It has therefore been called the ’13th sign of the zodiac’. However, this confuses sign with constellation. The signs of the zodiac are a twelve-fold division of the ecliptic , ie the 360 degree great circle in the heavens against which the planets are plotted in their orbital paths.Each sign spans 30° of that great circle, approximately the distance the Sun travels in a month, and (in the Western tradition) is aligned with the seasons so that the March equinox falls on the boundary between Aries and Pisces. Constellations, on the other hand, are unequal in size and are based on the positions of the stars. The constellations of the zodiac have only a loose association with the signs of the zodiac, and do not in general coincide with them. In Western astrology the constellation of Aquarius, for example, largely corresponds to the sign of Pisces. Similarly, the constellation of Ophiuchus occupies most of the sign of Sagittarius. AND – New visitors and Followers out there! 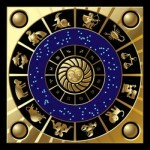 Do drop by with your observations….. and, of course, your Questions….on any astrological topic. This entry was posted in An Astrological Miscellany: of cusps, virgins, atomic scientists, Muhammad Ali and much, much more...(13 articles) and tagged Astrological sign, Astrology, Constellation, Ophiuchus, Sagittarius, Sun, Western astrology, Zodiac. Bookmark the permalink.